The Doe Run Company released its most recent sustainability report, available at sustainability.doerun.com. The Doe Run Company (Doe Run) released its most recent sustainability report, available at sustainability.doerun.com. As a privately held company, Doe Run chooses to report on its commitments annually as one way to keep its communities informed of the company’s performance and future outlook. Process improvements and other safety measures that contributed to record low workforce exposure rates. A multi-million-dollar update to the Resource Recycling facility that will enhance productivity and processing capability for lead-acid battery recycling. The completion of two new water treatment plants to manage water at the Sweetwater and No. 29 mines. $71 million in environmental spending in 2016. Doe Run’s sustainability report also highlights stories about the people behind the company’s operations. These employees include a retiree inducted into the National Mine Rescue Hall of Fame, a mine planner working underground, a former intern who now works as an environmental engineer, and a 43-year tenured employee overseeing remediation at Herculaneum. At the end of 2016, the company employed nearly 1,150 people at its Missouri operations. Doe Run owns mines and mills that produce lead, copper and zinc concentrates, and operates a recycling facility that can recycle approximately 13.5 million vehicle batteries per year. The company also contributed to the local economy by spending $140 million with 632 Missouri vendors in 2016. Doe Run’s sustainability website invites readers to share their views on the report and what they are most interested in through an online survey available at https://www.surveymonkey.com/r/S3CK2T5. Doe Run’s eighth sustainability report contains Standard Disclosures from the world’s most widely used sustainability reporting framework – the Global Reporting Initiative (GRI). As part of the GRI framework, the company reports its progress against a number of key indicators related to environmental stewardship, economic performance, labor practices and community engagement. A full list of the GRI indicators that Doe Run reports is available on the sustainability website. Based in St. Louis, The Doe Run Company is a privately held natural resources company and a global provider of lead, copper and zinc concentrates. Dedicated to environmentally responsible mineral and metal production, Doe Run operates one of the world’s largest, single-site lead recycling centers, located in Boss, Mo. The Doe Run Company and its subsidiaries deliver products and services necessary to provide power, protection and convenience. Doe Run has operations in Missouri, Washington and Arizona. For more information, visit http://www.doerun.com and sustainability.doerun.com. 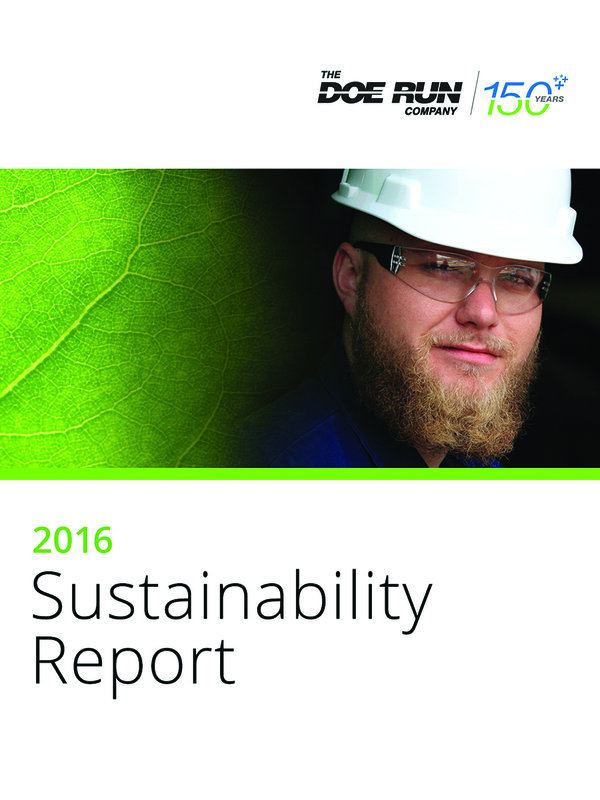 The 2016 Sustainability Report is available at sustainability.doerun.com.